I didn’t even know Russia had carriers. I did not even know Russia had boats anymore. 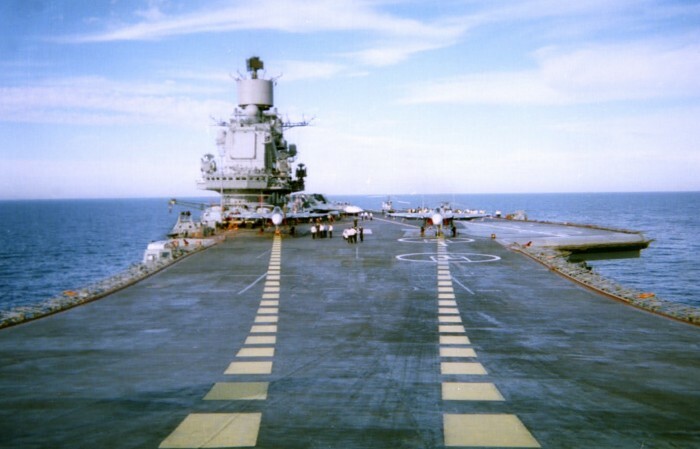 This is the Russian carrier Adm. Kuznetsov. Looks kinda of cool, but is actually a piece of crap. Hey Hanz, WTF are you talking about? I’m not sure where you get your info from but, it aint right. Freakin F-22 came out when? SU whatever still has yet to hit the pavement. Where is the argument? MIG’s fall apart regularly and F-16’s rule the sky. Russian steam punk planes are just that. F-16’s are land based aircraft, F-18’s can be both carrier based and land based. Give that man a prize! E-3 Sentry’s are land based, E-2 Hawkeye’s can be both carrier based and land based. Do I get a prize too?